I like the bike course, they will need one for motorcycles before long, better have lots of hay ready. Reid: [to Paul when they are alone]"Mom and Cort are crazy..."
Paul: "My cows ride bicycles!" How these handsome boys are growing! love this biking shot and what a cute conversation to record. My cows were all steers and live in my freezer! LOVE the dialogue exchange! LOL. They're so cute. i think they've seen the chik-fi-la cows! Those are some nifty cows. 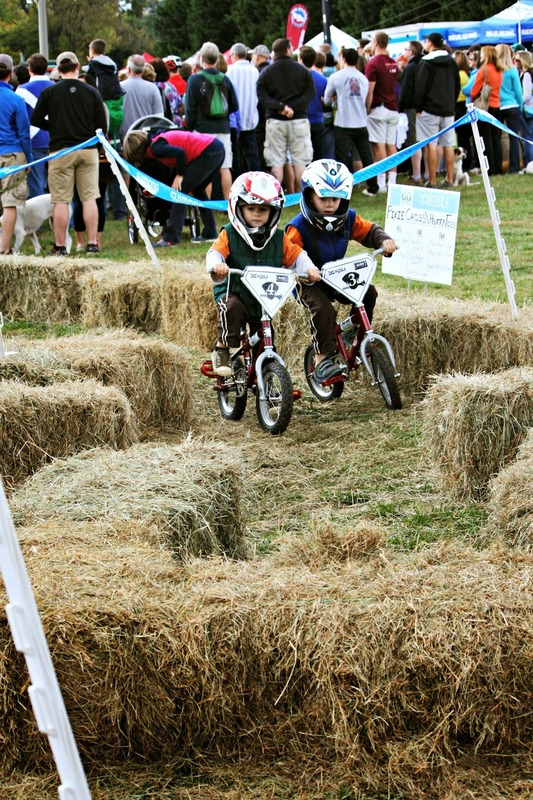 I've never seen a hay maze for bikes, that's pretty cool! So cute! Our cows growing up were very mysterious. I wonder if they could do karate moves? The hay maze picture is really cool! So is the car game you play. I bet that right now, his answer to everything is something about a spy! Yes, remember a previous post of mine about the Oreo cows? I bet the boys would snicker at them. Spycow saves the day! I love the way you encourage those creative imaginations. Spy cows sounds like a great movie idea! Both of your cows are way cooler than mine. They are so cute on their bikes! Those boys of yours always have me in stitches. Their imaginations are so cute and clever. I've never seen spy cows... that I know of! Oh that photo has me grinning from ear to ear! I have had goats jump on my car - but not over - yet. Blessings and Bear hugs, Lisa. Somehow, though, I don't think the cows would want a Bear hug. What cute little guys on those bikes! Your boys have the coolest cows ever. :) So funny!!! Such a cute little story! I sent you an email in regards to the dmca and shutting down the hack blog. Watch for it. I will help you! I need to keep my eyes open for some! Right now we are in Montana and I see cows all the time. Haven't seen any spy cows though. My cows are Ninjas and can jump over skyscrapers too! I love your kiddos. How fun!